On the 11th of February I turned 30! Something I had been dreading for most of 2017 and the start of 2018, but you know what - it's not that bad! Life is pretty damn good and I wanted to share with you what I did on my birthday, which happened to be on a Sunday - what else do you do when it's your birthday on a Sunday? 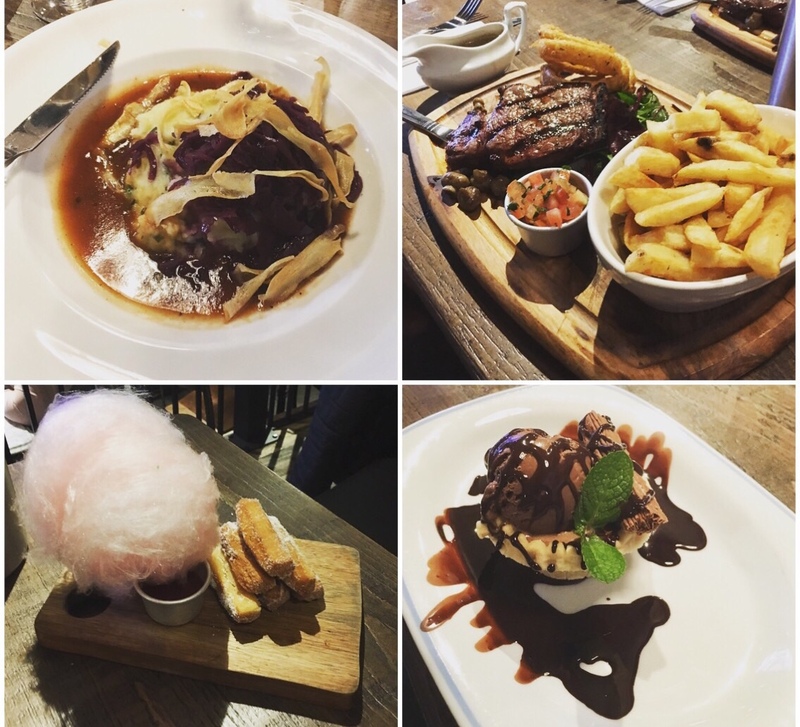 Have a Sunday Funday eating delicious food and drinking copious amounts of wine and gin - perfect! 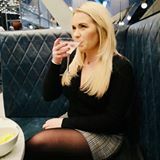 I wanted to get out of Chester (where I live) for the day, so I decided I wanted to go to Liverpool as it's really easy to get too from Chester and the train is super cheap, plus there was plenty of places to choose from to eat - too many!!! After what seemed like a lifetime of searching TripAdvisor for nice places to eat (there are literally thousands of places to choose from), I decided I wanted a nice pub but not just pub grub, so I finally settled on George's Great British Kitchen which is ranked #18 out of 1,459 restaurants in Liverpool. "Everything we did was all to make sure that every person who walked through our doors would have a jolly good time, whether there's something to celebrate with the family, a much needed catch up with chums or just a place to relax after a spot of shopping or before a trip to the cinema or theatre! With nearly two years gone since we opened, we've been absolutely flabbergasted by all of the spiffing things everybody has had to say about our home & our people. We've even picked up some pretty special awards along the way too? winning 'Best New Venue' in 2015 and 'Best City Centre Experience' in 2016 at the Nottingham Post Food & Drink Awards. We've also won the International Restaurant & Bar Design Award along the way!" The atmosphere in George's was nice, it was quite quiet with it being a Sunday, but that was to be expected. We were looked after by a lovely lady who's name I think was Kate.....I should have written this post sooner so I could remember, but as you can see from the above picture a lot of wine was consumed! I was a little bit worried when I booked the table online as it said we only had 1.5 hours, but we weren't rushed at all and the food came out quite quickly, which was good for us as we were starving! Between us we had a bit of everything from venison covered in a delicious red wine, honey, anise and orange sauce to a traditional 28 day aged Aberdeen Angus 8oz rump, served with a stack of crispy onion rings, baby leaf salad, grilled cherry vine tomatoes, slow cooked button mushroom confit, twice cooked chips and a pot of fresh tomato salsa - YUM! This was perfect for me - I'm such a big kid at heart! The food was tasty, served quickly and well presented. We all felt comfortable, extremely merry and cosy on a freezing cold and windy day in Liverpool! We were quite lucky as they had a Valentines day offer on the food and wine which was 2 courses and a bottle of wine between two for £25.00 per person (wine value was up to £30). 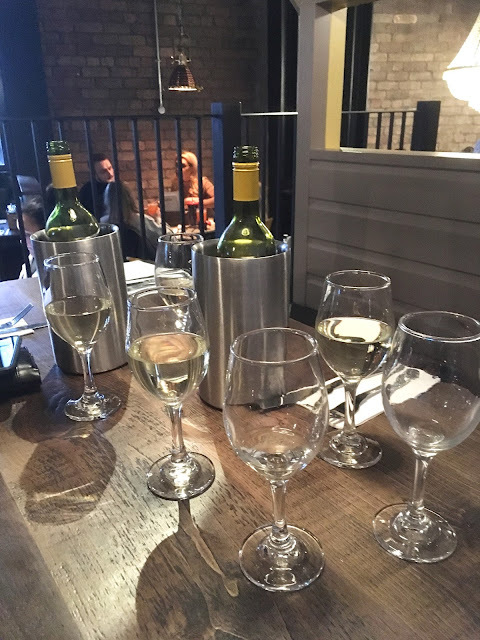 We paid £25 each, which I think is pretty reasonable for a shed load of wine and delicious food! 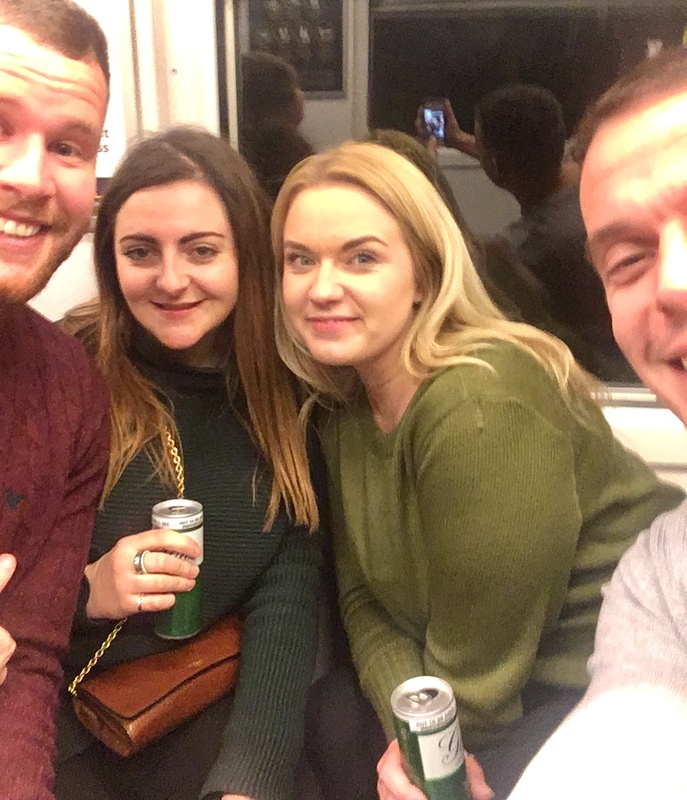 We then went on to drink a whooooooole load of gin in different bars, including a karaoke bar (yep, I had to do my usual Alanis Morissette on the karaoke - cringe) and then we made our way home on the train, all extremely tipsy, full and happy - see picture below! 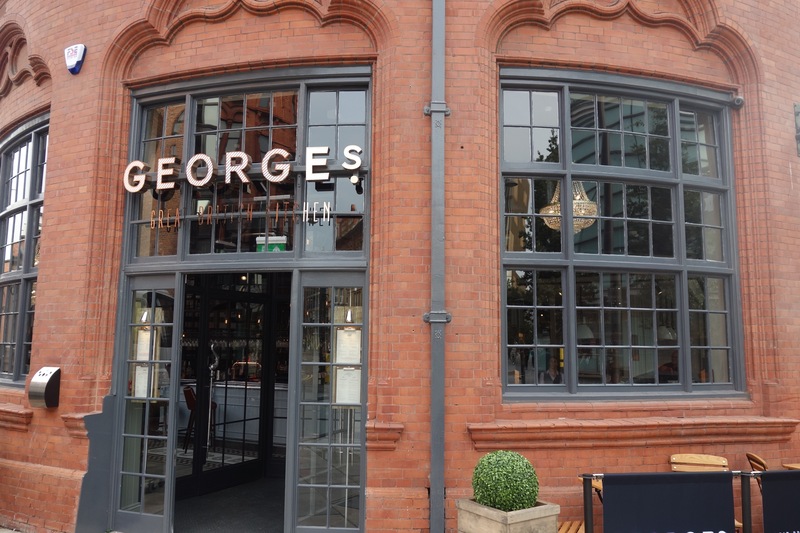 We really enjoyed visiting George's Great British Kitchen in Liverpool and I would definitely recommend going there for a chilled out delicious afternoon/evening. Have you ever visited George's Great British Kitchen?